You’ve waited a whole year, and now it’s time again! The Scaregrounds are back with one huge attraction and half the price! 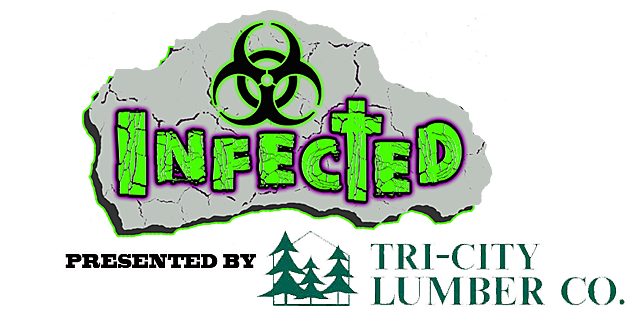 Tri-City Lumber presents: Infected! Infected is the featured haunt this year, and is the largest haunt in Eastern Washington over 7200 square feet of horror. Something is lurking around every turn, every hallway, from above, behind, below. Can you handle it.? A genetically engineered vaccine, originally created as a cure for the common cold, turns into a lethal strain. It kills 75% of those infected, mutating 23% into nocturnal blood thirsty creatures with incredible strength and speed that are attracted by sound. They have become known as the “Virals”. Only 2 percent of the human race appears to be immune. As each safe zone gets overrun by the Virals, and the subways get derailed, the only way to stay alive and uninfected is to travel by foot to the next Safe Zone. In order to do this, you must work your way through a maze of dark subway tunnels, old over-grown power stations, and small evacuated towns AS QUIETLY AS POSSIBLE, all the while avoiding the Virals that could be lurking around every corner. Will you survive Tri-City Lumber’s… INFECTED! ?